The 504 protest in San Francisco - outside the building. Photograph by Anthony Tusler. The little-known story of the 504 protests is amazing. 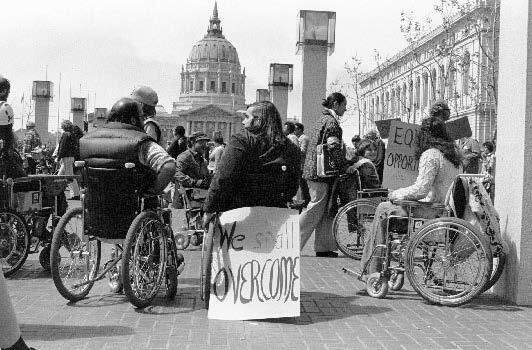 On April 5, 1977, dozens of disabled people from diverse racial and social backgrounds entered San Francisco's office of Health, Education, and Welfare for twenty-five days in what remains the longest occupation of a federal building in US history. They came on crutches, using canes, and in wheelchairs; some used American Sign Language, others augmented communication devices. Many others contributed simply by showing up to offer support. Most arrived with little more than the clothes on their backs, guided by a few vague ideas about why they were there. Yet enough of them had political smarts, experience with building coalitions, tenacity, and fire in their bellies to confront the government of a major world power about their civil rights, and win. They had come because of Section 504 of the 1973 Rehabilitation Act. Buried in the law to accommodate returning Vietnam veterans was a provision based on the 1964 Civil Rights Act stipulating that individuals with disabilities “should not be denied the benefit of, or be subjected to discrimination under any program or activity receiving federal financial assistance.” Cast in broad terms and bureaucratic language, Section 504 - which would serve as a model for the Americans with Disabilities Act thirteen years later - basically said that everything touched by the U.S. government needed to be fully accessible to people with disabilities: schools, universities, public offices, transit systems, hospitals. After over four years of government stalling that extended to the newly-elected allegedly pro-disability rights Carter administration, the regulations still awaited a final signature. Infuriated, hundreds of protesters around the country occupied several federal buildings. Most were starved out within a day or two. But San Francisco was different. The organizers' incredible resourcefulness and months of cementing relationships with local community organizations resulted in an unlikely, dedicated coalition of supporters that included the Black Panthers, the gay community's Butterfly Brigade, labor unions, Glide Memorial Church, Safeway and McDonald’s, along with sympathetic local and national politicians. Thanks to food, showers, and other forms of help, the 504 occupiers held on for nearly a month, generating national attention and ultimately helping to gain the support necessary for signing the regulations. The 504 Occupation would be a watershed personal and political moment, one that solidified the Bay Area’s key role in the struggle for disability rights. The Americans with Disabilities Act would not exist in its present form - or even at all - without the energy, people, and determination galvanized by this unparalleled historical moment. Thanks in no small part to the 504 sit-in, cross-disability thinking would be central to the ADA’s scope and reach and would shape the disability rights movement in general. The experience of spending more than three weeks in close proximity among people with a wide array of disabilities during what became simply known as “504” fostered an esprit de corps and coalitions that would have been unimaginable a few years earlier. When officials first cut the phone lines, Deaf people stood at the windows and used American Sign Language to convey messages between protesters inside and outside the building, while, blind people fed and toiletted quadriplegics. Friendships and romances formed. The experience of 504 helped create a sense of community grounded in successful activism that in turn gave people with disabilities a sense of their historical agency. Once people with disabilities had shown this prospect to the outside world and to themselves, they could continue to fight for expanding their civil rights. Indeed, a number of 504 participants would go on to help forge the ADA as well as key organizations such as Disability Rights Education & Defense Fund -DREDF (1979) and the World Institute on Disability – WID (1983) that promote disability rights. The Americans with Disabilities Act is far from perfect. But thanks in no small part to our brave sisters and brothers 37 years ago, at its core the ADA is more about rights than about charity. Let us not forget that this movement, like our nation and its other ongoing struggles for civil rights, was forged in revolution. By sharing this history, we hope to inspire? incite? future generations to continue this important work.